Those of you who are more into apocalyptic drone-doom might have heard of the Providence, RI, USA duo The Body. I tried to bring that unit into the spotlight by reviewing their 2010 release All the Waters of the Earth Turn to Blood. On it, at least in some of the songs, a very prominent feature was an all-female a-capello choir, certainly bringing uniqueness to All the Waters of the Earth Turn to Blood. That choir was another Rhode Island collective, combining more than 20 female singers into one complex vocal harmony group, called Assembly of Light. At a Loss Recordings have taken a bold step and produced some of the most non-metal records put out by a drone/noise/doom label, a self-titled Assembly of Light LP. When I am saying one of the most non-metal records I truly mean it. 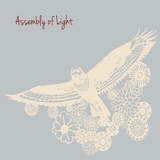 If you happen to have any sort of “heavy” definition in your music orientation, if you need distortion, rhythms and guitars with your music, you will have to get patient with Assembly of Light. You will get none of the above, but you will get the most weightless, ethereal and floating sensation. The angelic female choir just brings waves of warmth, lapping one’s aural shores with its endlessly modulating ah-ohs. Although completely secular Assembly of Light definitely have an almost religious reverence in their all-vocals hymns (beginning of Treelight) and could easily conduct a service in some catholic cathedral. Subliminal and meditative, this music projects either the innocence of a human being’s birth or the unbelievable sadness of one’s passing. Into the Woods I has a total feel of weeping female mourners exercising their solfeggios. If the movie Ghost was ever looking for the soundtrack for when the soul leaves the body they should have looked straight for the Insides opener. With the first couple of tracks The Body members return a favor and provide some variation in the form of a contrasting male voice and spoken vocals. Transition has violin and some distorted rhythms. Piano is also present here and there, while Treelight reaches into a somewhat dramatic climax around 3 minutes. Beginning with the Into the Woods trilogy, however, Assembly of Light becomes purely an a-capello female entity and your patience will be challenged. I know mine was. As much as these female singers are eerie and beautiful, I would want more melodic flow and variations in these songs, so they don’t have to hold me purely on the aesthetic factor. Aerial Ruin tried for something similar in the terms of ethereal, while Aesma Daeva and Autumn Tears have similar artistic concept but are a lot more orchestral and gothic. If you need to totally submerge during a séance of yoga Assembly of Light is something to reach for, but quoting this output in numerical terms on a metal review site is ridiculous.